Well, we are back in Omaha after our 10 day TEXAS adventure, we came home to a HOT house. AC quit working while we were away and our house is 94degrees. The repairman - nice Francisco - came today to fix the problem and we are now down to 88. I think we will need a new unit soon as we have seen Francisco 3 times this summer. The heat made me think of this yummy dessert we had at my brother's house. His wife Stacy - made a Banana Pudding different from the one I make. 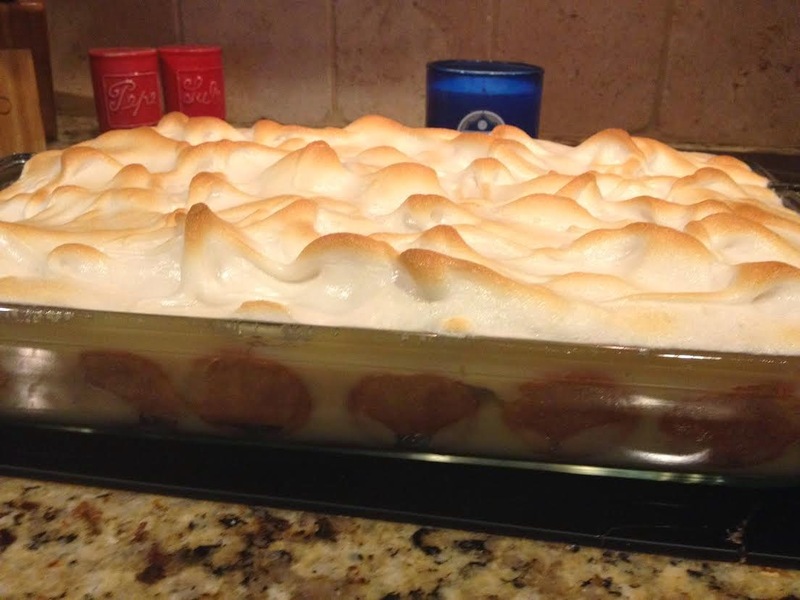 I make one with cooked pudding and meringue but Stacy's was very summery and very refreshing! I will share both with you! This version is from my mom who is a great cook. My dad and my husband request this often for Father's Day or any special occasion! Line a 11 x 13 glass dish on bottom and sides with Nilla Wafers. Add a layer of sliced bananas and a layer of cooked pudding. Repeat then add Meringue. Whites are at room temperature by now. Beat with mixer and add 1 tsp Cream of Tartar. Beat at high speed until whites form a stiff peak. Add sugar and vanilla and beat to get a little stiffer peak. Spread over pudding and seal edge. Bake at 350 just for about 5 minutes to brown meringue. Serve warm or chill and serve cold. My hubby loves it cold - so do my girls! *Numbers in parentheses are for a square pan. The rest is for a glass 11 x13. Mix pudding according to directions. Add condensed milk and Cool whip to pudding mixture. Line bottom and sides of a glass 11 x 13 with vanilla wafers then a layer of sliced bananas on bottom then layer of pudding. Repeat. Top with crushed vanilla wafers. Chill!